Beautifully Restored Home in the Heart of Red Lodge, MT! 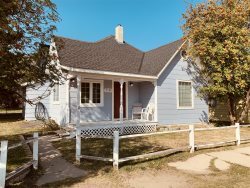 Anne the Victorian Queen ~ Very Convenient Downtown Red Lodge, MT Location ~ Sleeps 17! Anne the Victorian Queen ~ Beautifully Restored Home in the Heart of Red Lodge, MT! A vacation home fit for a queen… or king. Step into this fully restored 1902 Victorian beauty and you will be embraced with nostalgia. From the Victorian furnishings to the local yesteryear paintings and photographs, Anne the Victorian Queen, offers you plush comforts in each private room with a double bed and your very own ¾ bath in 5 out of the 7 rooms. On the upper level is a bathing room with an old fashioned claw foot tub. The kitchen is fully equipped with top of the line appliances and a grand dining area. There is also a half bath on this level for your convenience. Anne is fully handicapped accessible with grab bars, ramps and a modern elevator to all three levels. With its expansive patio, Anne is the perfect setting for friends and/or family. Relax and enjoy the hospitality that Red Lodge has to offer from the warmth and comfort of this century old home. Built in 1902, Anne the Victorian Queen, has been fully restored to its original beauty. The initial structure was taken down to the bare bones and brought back to life with all the modern conveniences of today. The Main & Upper Levels sleep 10. The lower level sleeps 7 people and has a 3/4 bath, an efficiency kitchen, living and dining area with a separate entrance from the upper level. Anne is located 2 blocks from Red Lodge’s main street and is kitty-corner from the grocery store. Directly across the street is Lion’s Park and the Arts Guild, where different events are held throughout the year. In the winter months, you can enjoy ice skating right across the street (rent your skates at the Ski Station). You are also a short 15 minute drive to Red Lodge Mountain and one mile from Red Lodge Golf Course. A vacation at Anne The Victorian Queen is sure to be a royal treat for any family gathering or special occasion. The house was so clean, comfortable, plenty of space for a big group! Great house in a perfect location, beautiful kitchen! Our group (13 persons) was fully accommodated in the clean, mostly spacious rooms, interesting architecture, elevator important, kleenex available in every room, kitchen spacious; well stocked. Everything was just great - thank you! Great place, great town, great time! Elegant and beautiful home. Home was charming. Perfectly outfitted with best appliances, plenty of dishes, glassware, pots and pans, etc. Perfect for a large group/family. Online information was accurate and well done. Heather and Jackie were terrific! Great location, amenities. Just wanted to reach out and let you know we had a great time staying at the Anne, the Victorian Queen. The place was lovely and we had everything we could possibly want....plus the store across the street and the quaint downtown just minutes away. We had so much fun at our niecess wedding....thanks again for making our stay perfect. Anne the Victorian Queen has been the cleanest, most enjoyable rental we have ever had the pleasure of staying at. Beautifully furnished and as comfortable as home! Thank you! We were so happy to find such a beautiful, spacious home to accommodate our large group of family and friends. It was perfect for several days of skiing, eating, card playing. We had nearly given up finding a place and were afraid our mini vacation wouldnt happen. We will be back! "Exceptional Vacation Home" - Cleanest vacation rental we have stayed in. We have been in Black Hills, Red Lodge, Florida and others. This is our #1 choice. Its like coming home to Grandmas!! This home is the finest vacation rental our family has used anywhere! It was a great advantage that each room has its own bathroom! Lots of room for everyone, great for entertaining, beautifully furnished but not overdone, and the quality of craftsmanship made our stay a real treat! The elevator was a great convenience to those for whom stairs are difficult and for luggage. Big enough for a large group, but still warm and welcoming. The grocery store is right across the quiet street, and downtown shopping is a quick 2 blocks away - what a great location! We cant say enough about this home, we thoroughly enjoyed our extended stay! The Queen Anne rental is the nicest place we have ever stayed as a family. We brought our 3 grown children and their families. We had 8 adults and 7 grandchildren. The big oak table was big enough for all of us and game time was great. Having the 2 kitchens and all the washers and dryers were wonderful. All the cookware, dishes and silverware were very nice and plenty. The bedding and towels were first class. Could not have enjoyed it more. Would love to come back again. The wood doors and all the lights, wood staircases are so beautiful.